Ford Transit County 4X4 | Website dedicated to the Ford Transit County 4X4. This particular Van owned by Eugene Speed. The Ford Transit, possibly the most successful and recognisable van in the UK. Originally launched in the UK in 1965, it was available in countless combinations of bodywork, trim, engine and gearbox. One of these options was for a four-wheel-drive variant, capable of going where the regular two-wheel-drive Transit would struggle. 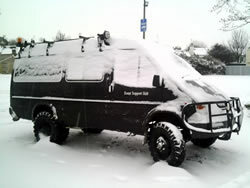 A handful of companies offered 4×4 conversions, the most popular of which was provided by County Tractors of Knighton in Powys, who converted vans on behalf of Ford Special Vehicle Operations (SVO) as a factory option. The first Transit County models were based on the Mk2 Transit model, both long and short wheelbase. The conversion comprised of a Dana 44F front axle and NP208 transfer box (both lifted from the Ford Bronco), three custom propshafts to connect the transmission to the transfer box and then to the axles, heavy duty leaf springs, larger front brake discs, heavy duty steering box, and a rear subframe to increase the ride height. The rear axle was a standard Transit item, and 16 inch rims were fitted all round. 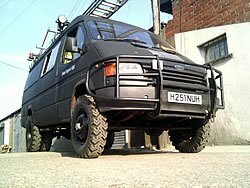 Mainly used by utility companies like National Grid, by the MOD, and mountain rescue teams, the Transit County 4×4 proved to be a capable vehicle both on and off road, with the ability to carry both crew and equipment just about anywhere. 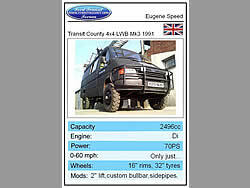 With the introduction of the Mk3 Transit in 1986 came the next generation of the County 4×4. 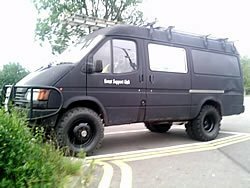 This would prove to be a very popular and successful version of the Transit County 4×4, and the last to use the beam axle layout. Later (1991 and onwards) County 4×4 models switched to using an independent front suspension setup which was inherently more complex in design than the earlier beam axle models. Later panel vans also lost the twin-wheel rear axle that had been fitted on earlier LWB versions. Design and supply of drivetrain components for County 4×4 models has more recently been by Countytrac, a division of the M.J. Allen Group, who are still actively involved in the development of the latest Mk7 AWD Transit and Connect models. My Transit County 4×4 is a Mk3 160 LWB model first registered in September 1991 to the RAF in Anglesey. This is where it lived for many years, before changing hands a few times in Wales. I bought it in February 2010, after many years of trying to find one. It has a 2.5 direct injection deisel engine and wide ratio 5 speed gearbox, coupled to an NP208 transfer box, giving selectable 2WD and 4WD in high range, and 4WD in low range. The rear axle is a standard Transit item, a type 53 G Salisbury. The front axle is a Dana 44F, both axles have a 5.89:1 diff ratio for excellent low-range performance. Wheel rims are 16″, and are fitted with 7.50×16 Deestone Extra Traction tyres. Other additions are the custom made bullbar and the split side-exit exhaust system. Inside, there is seating for six and plenty of room in the loadspace for all my stuff. Future plans include a turbodeisel engine, a 4000kg winch and a PTO compressor/generator set. Lots of information and more pictures of my van and others like it can be found on the Ford Transit Forum and Ford Ranger site where you can also find spares and helpful articles.